Creativity State MEASURED!+KnotSlipping-Into DNA-Alphabet of Genes! 1. Creativity State MEASURED!+ BlissTuner Released - 2005 Tour Announced. 2. Knot Slipping - Into the Coeur of DNA-Alphabet of Genes! AND the ONLY way anything in biology becomes immortal? Could this tetra compression 7 axis model be the REAL KEY TO DNA- as well as- Alphabets? From Dan Winter: "Rollin McCraty and crew at Heart Math were algae salesmen and rock musicians til I taught them to how to take an EKG, how to spectrum analyze it, and how to connect that to coherent emotion. The real irony is they vehemently refused to see those harmonics I showed them as COHERENCE - until I spent a year convincing them: NOW they take credit for originating Heart Coherence! - in spite of the fact that the literature ("Instinct to Heal" etc.) is clear that I did. The worst part is they CONTINUE to mislead the public into thinking that breathing at 1 frequency (they strangely call 'Freezing a Frame') is heart coherence. It is actually not variability or coherence. REAL HEART COHERENCE is measureable and they haven't done it. What they have done is sent a team of vicious legal agents around the world making life hell for people like Dr.Alan Watkins ( cardiac-coherence.com ), and James Barret (heartbeat2000.com ). Quite the opposite of the supposed loving integrity they project in shallow image." Dan Winter - short vitae: Graduate trained in Psychophysiology mentored by Dr Al Ax, one of biofeedback's founders. Also trained as Systems Analyst with IBM in Detroit, Chicago and Poughkeepsie. He was priveleged to be work with many of the early Physics of Consciousness leaders: Ben Bentov, Chris Bird, Marcel Vogel, even - Bucky Fuller. 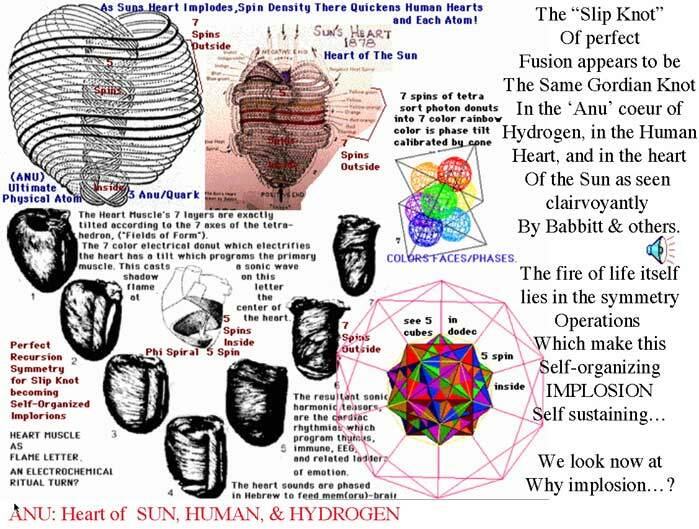 BioElectric Inventor himself, Dan later invented the HeartTuner ( goldenmean.info ) and now the BlissTuner ( goldenmean.info/blisstuner ) which portend to revolutionize heart coherence, empathy, and creativity training. He has been a world leader in Sacred Geometry and Physics of Consciousness teaching for almost 20 years- often teaching in 10-20 countries anually. Also a trained musician, choir director, computer animator, and author of 5 books ( see goldenmean.info ) he also writes about the extraterrestrial origin of DNA ( goldenmean.info/enki ). Based currently in Germany, France and UK - he currently travels with partner Valerie Sandelin. He is passionate to see young people offered the chance to see the real and scientific power of access to personal bliss experience. Knot Slipping - Into the Coeur of DNA-Alphabet of Genes! Could this tetra compression 7 axis model be the REAL KEY TO DNA? 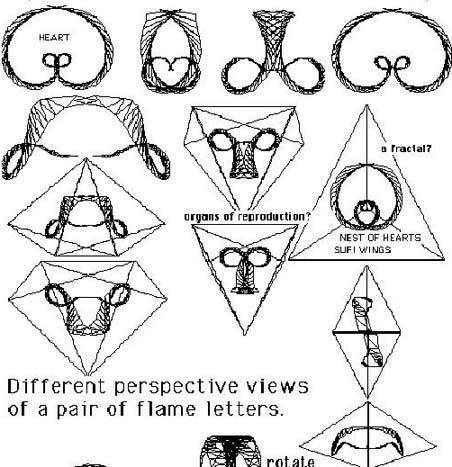 -The seven symmetry angles of a tetrahedron perfectly reveal a profoundly hidden 7- fold symmetry map on a spin-coupled toroidal surface. a clue to the sacred physics of the mechanical world? The seven symmetry angles of a tetrahedron reveal a profoundly hidden 7- fold symmetry map on a spin-coupled toroidal surface. The tetra can be thought of as the sumtotal symmetry of mechanical principle. 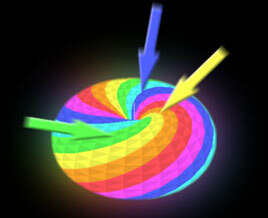 The toroid here embodies the transformation between ROTATIONAL INERTIA vs the CETRIPEDAL INERTIA (Gravity) - 'translation of vorticity optimized by Phi'. . Their mutual (co-defining) physics can be thought of as the (only) sustainable symmetry of non-destructive charge interaction between the two. Together they form the general physics blueprint of all unit life (the esoteric "Anu"), atomic, cosmic or biological, and more specifically that of conscious perception of a mechanical world. The ONLY tilting angle of the toroid relative to the tetra for which it works, is the angle prescribed by the orientation of both the toroid and the tetra inside golden mean projective geometry (icosa-dodeca "implosion" physics). This is the hub of cosmic creation. 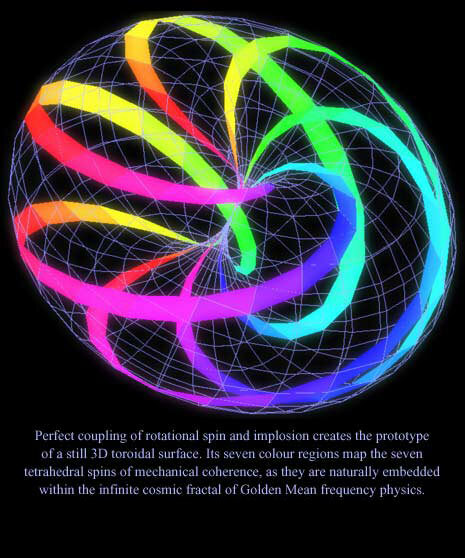 In this, case, the spiral map on the surface of the toroid shows the ideal coupling of rotational and toroidal momentum as defined by the Golden Mean projective physics, in the form of seven spiraling charge regions. Two ways to store memory in a compressible medium: A) spin vector thruster and B) charge vector thruster. If the geometry is optimized, the result in both cases is the same and the physics of the mechanical world merges back into its primary cause. 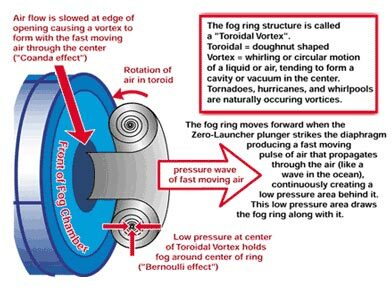 This dual aspect of the toroid, the coupled spin geometry and the surface thrust geometry, makes it function as the archetypal shape and operative principle of going in and out of mechanical creation, which is the true physics of life force and individual perception. 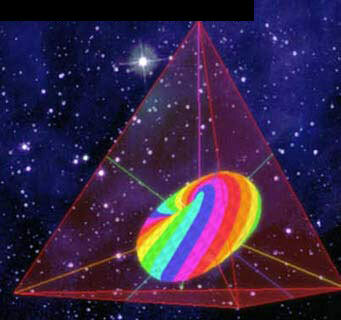 Reference Article: 7 Arrows of the Heart and 7 Colors of the Rainbow, from the Hydrodynamics of the Perfect Ink 'Drop'? 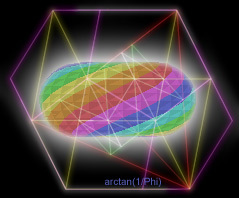 suggesting the physics of color in why the photon donut self organizes into the 7 colors of the rainbow when passing thru the compression sorting - 'traffic jam' of the prism. 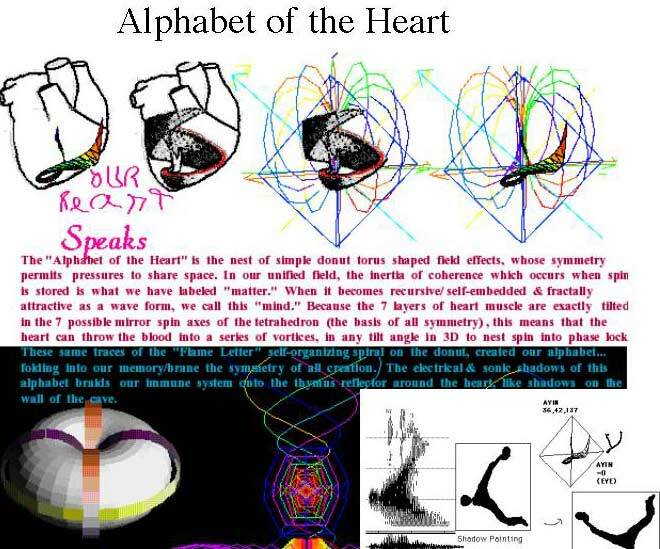 (Reference: Alphabet of the Heart manuscript at http://spirals.eternite.com ) It would also be important to see the original pics on the fusion symmetry slip knot map which is the heart of hydrogen / ANU, the human heart and the Heart of the Sun.. This helps introduce what happens on the 7th recursive superposed piezoelectric (phonon wave of BLISS induced) BRAID of DNA. The Dodeca (4th Dimension for a cube) stair which is the THREAD your DNA begins with is a 5th axis of spin - add 7 more - you have 12 SUPERPOSED SPIN AXES - or 'threads' in your DNA. + How's The Radiance of Your Magnetic X "Designer Genes" Today? So- if we apply this to the origin of ALPHABETS (origin of all symbol). 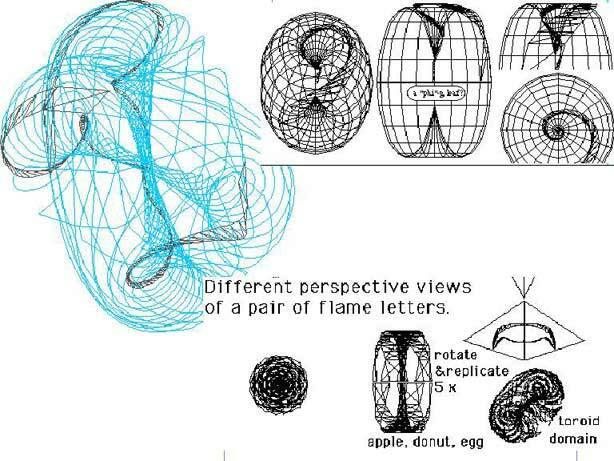 The process of discovering which approach angles for charge fields or donuts would allow insertion / non-destructive compression- into the "Burning Fountain" (see the book on origin of language by this title- author: Wheelright) which is the charge core of the THROAT OF DNA. - "We knew that - to symbolize IS to EMBED - NOW we know to embed in where! 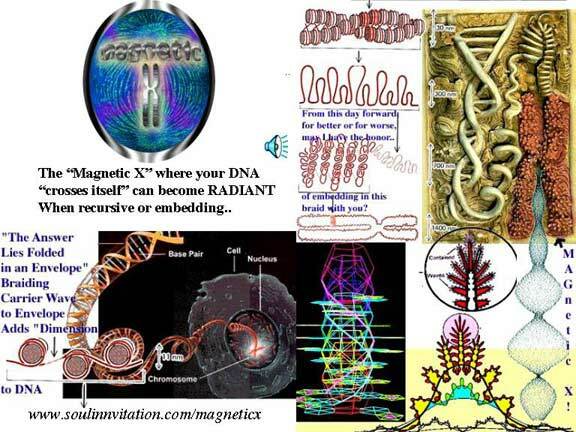 (DNA implosive center)"
So the only origin of symbol that ever existed (ability to embed) was the symmetry alphabet to allow charge (all biologic memory) to enter into the throat and braid determination of DNA. This makes sense - because no biologic event has any ability to become sustainable / or cause to enter history UNLESS IT IS RECORDED IN THE BRAID OF DNA! AND the top down view of the origin of Alpabet Letters! Now do you know why the i has a dot? 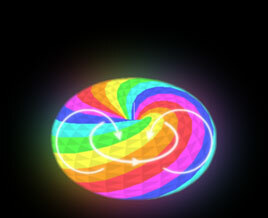 (Consume the perspective - leap off flatland - get up off your cross-) Here is 1 unchanging golden mean spiral wrapped on the self organizing donut - changing your point of view. He tries to create commercial value for his piece of jewelry - without the pure principle of Phi /recursion. 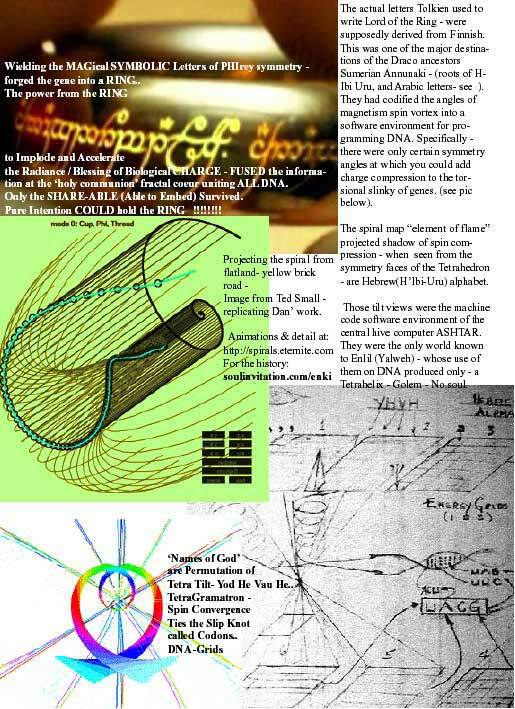 Tenen also does not understand that being trapped in just his Hiburu Tetra (the MATRIX) - is actually a loss of ensoulment (see how Golem are made in Hebrew- tetra helix DNA does not implode or shine) - only the Golden Spiral and pent allows the way out. 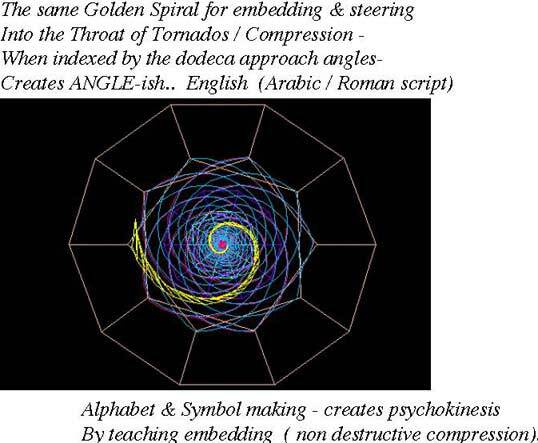 The origin of symbol is only the -Golden- wave geometry of EMBEDDING - because that is what allows the outside - inside! 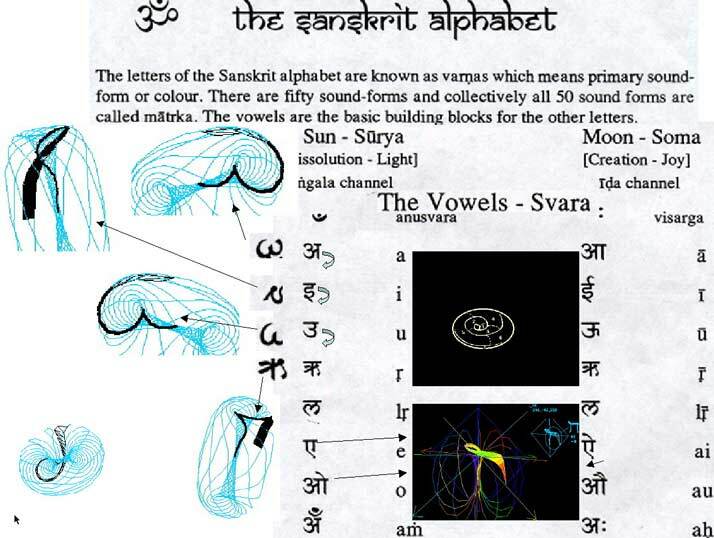 If we remove the right angle bar (which presumeable serves the same purpose as the 3 marks in Hebrew- to orient you with respect to angle of the vortex contained in the referred Tetra/Cube) -- we see the same origin of language in Sanskrit. 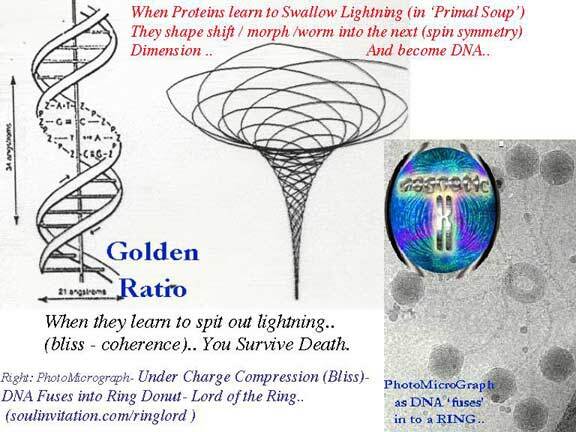 Namely- how to find you way into the tornado on surface of donut.. Self-Organizing - Compression Entry - How to sustain ANY wave - especially including every wave (of charge) that IS biology - into Genetic compression. 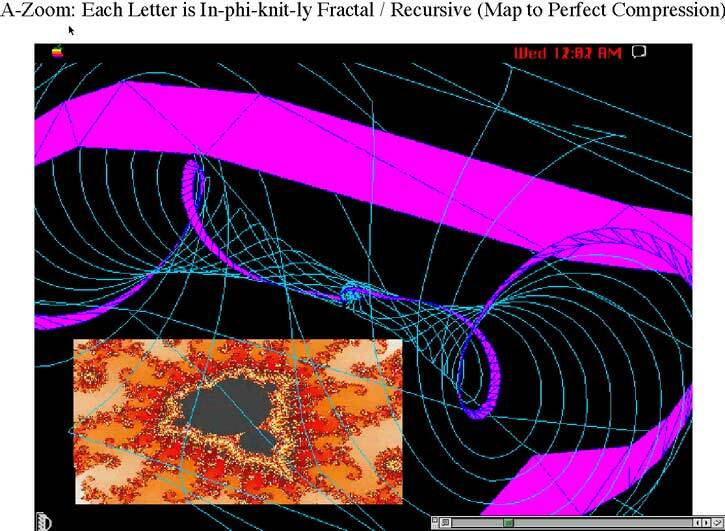 More on the only true origin of language that ever sustained - is the symmetry map for charge donuts entering DNA... see the Vincent Bridges notes in- goldenmean.info/ark : COSMIC CRYSTOS-Galactic Wave Physics & Vise-like grip of compression - "Reading the Green Language of Light at http://www.jwmt.org/v1n4/readlight.html for some interesting frameworks for the DNA discussion. Keep in mind that both the I Ching and the Tarot have inherent structures that reflect the "Great Secret" of how to correctly align space/time." " It is possible to reconstruct the dragon's speech, the green language of light's syntax, grammar and vocabulary, because fragments of that original green language of light can be found in the divinatory systems used by all nautes, shaman and initiates, from the archaic oracles of the I Ching to the medievalism of the Kabbalah and the Tarot. By comparing these to the structure and processes of DNA, we can assemble a complex of photo-linguistic meanings that allow us to fulfil the ultimate goal of man's spiritual yearnings, that of reading the divine." 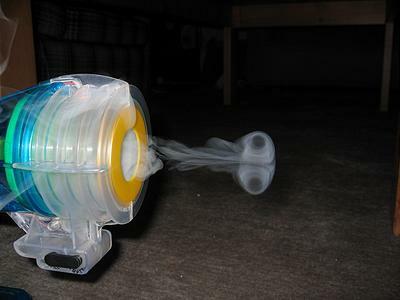 Only dollars away from STEERING YOUR OWN TORNADOS!? 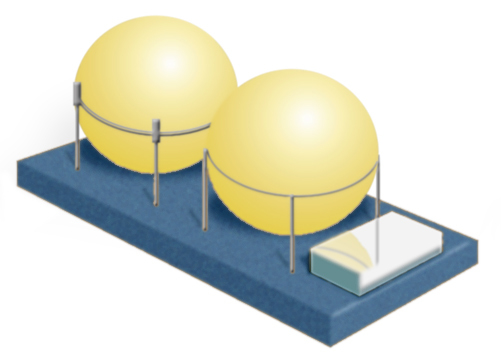 Revolution in LIFE FORCE / VITALITY MEASURE: 2 Different Sets of the new Twinned for active noise suppression - gold coated egg spherical transducers are due in the next month. One in real ostrich egg + gold from Netherlands - and another set custom molded and gold coated at the famous Sevres national ceramics institute of Paris. Exciting new tests get underway to confirm that we can even get replicable commercial life force measures in more noisy store kinds of environments. Above: The same Dr.Korotkov who helped inspire the BlissTuner and measured the Death phenomenon electrically - is recently published as measuring the electric field of the soul (what we call fractal charge compression) - after death. 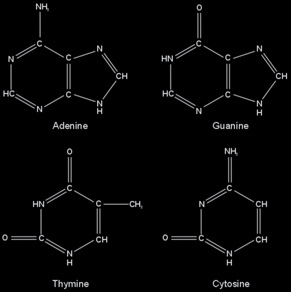 also from Vincent Bridges: Exerpt from - http://www.jwmt.org/v1n4/readlight.html "From the work of modern molecular biologists Fritz-Albert Popp and Mae-Wan Ho, we know that DNA emits a weak form of coherent light that has been demonstrated to work like a communication system between cells and even between larger organisms. In this sense, the art of light is indeed the instrument of the spirit. It is nothing less than the mechanism, the framework so to speak, that allows Mind to exist in the universe. The language of light emitted and received by the DNA may be the original of all languages, the ultimate language of initiation. These are stunning assertions. Fulcanelli informs us that the western cabala used by the troubadours and the builders of the cathedrals is based on the language of the Argonauts and the quest for the Golden Fleece. Which in turn is but one application of a vast Ur-language of symbols, derived perhaps from the DNA itself, that unite the global cultures of mankind, from the Inca to the ancient Greeks. And, to top it off, he told us that traces of it can be found in the language of the Gypsies, a fairly obvious reference to the Tarot, long held to be a Gypsy invention. Is he telling us that the Green Language, which is heard according to David Ovason only by those "who have clothed themselves in the skin of the dragon," is simply a symbolic approximation of the information, transmitted by weak laser pulses, coming from our DNA? According to the work of anthropologist Jeremy Narby, this Ur-language of light is a "forest television" of images in which "DNA is a snaked shaped master of transformation that lives in water and is both extremely long and small, single and double. Just like the cosmic serpent." His assessment agrees with Ovason's comments that only one who has the skin of the dragon, or has become one with the cosmic serpent of DNA, can understand this symbolic language of light. Could it be possible, by looking at the structure of DNA, to reconstruct this dragon's speech, this green language of light's syntax, grammar and vocabulary? And could it be, as Fulcanelli suggests, that fragments of that original language of light can be found in the divinatory systems used by all nautes, shaman and initiates?" When you consider the origin of alphabet (donut field entry angle indices) -- think of this note in John Titor: "Didn't Tipler say there was no event horizon? TimeTravel_0 : No..he said it was possible to approach a massive gravitationl field from certain angles and not get squished. " John Titor-recommended web site: " Greetings. I am a time traveler from the year 2036. I am on my way home after getting an IBM 5100 computer system from the year 1975......My "time" machine is a stationary mass, temporal displacement unit manufactured by General Electric. The unit is powered by two, top-spin, dual-positive singularities that produce a standard, off-set Tipler sinusoid." "This is a picture taken in the fall of 2035 during my training. 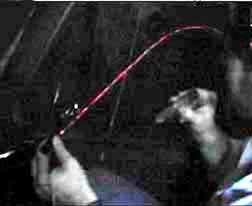 It shows my instructor beaming a handheld laser outside the vehicle during operation. The beam is being bent by the gravitational field produced outside the vehicle by the distortion unit. The beam is visible through smoke that is coming from his cigar." Note from Dan W.-if our scientists were not so primitive to see that self similarity can turn charge compression in to acceleration-(time travel) - we might not be in so much trouble as a genepool. Without lucid dreaming (time travel) teams - the genepool is eyeless. No wonder the returning Drac parasites are free to eat souls. 1. High ground, 2. Shelter from High Wind, 3. Far from Cities (100=?mi), 4. Access to Non-Surface Water, 5. Seeds store, 6. Extended Family Community, 7. Fenced or secure large garden. Not worth $1500 for something you already know, though. GOVT. AGENT: How high are the light towers? SWANN: Well, tall- about or let's say over a hundred feet. But I think I got aglimpse of the crater's edge. On it I saw a very large tower...if I compare it to something I am familiar with in New York, about as high as the Secretariatbuilding at the United Nations. SWANN: But this stuff is big....I thought everyone was having trouble just gettinga couple of guys and a dog into orbit. I thought the only thing we got on the Moon was a flag planted in some crater somewhere....You mean-- am I to assume this stuff is not OURS! Not made on Earth? AGENT: I can't tell you very much since doing so would endanger our missionand perhaps you, too. But I could ask you what YOU think is going on? SWANN: ....from all I can tell, Earth is under some kind of siege...you are desperate enough at least to try to employ psychics to help you out. AGENT: You see, I don't have to tell you anything. Remote viewer sees more than a "man in the moon"
The View from Marrs by Jim Marrs challenges bureaucratic secrecy and the status quo. Big Media watch out! Naked male workers working under bright lights on the moon, tall buildings, exotic machinery, and strange vehicles leaving tracks in the lunar dust - all this and much more was seen by Ingo Swann, the man most responsible for the phenomenon known as remote viewing. Swann was invited to take a mental look at the moon by a man he knew only as Mr. Axelrod. This man might have been a real-life counterpart of the cigarette-smoking man of .X-Files. fame. Mr. Axelrod claimed to be part of an ultra-secret government group investigating alien activities on both the moon and the Earth. This actual .man in black. took Swann, blindfolded, to an underground government facility and had him agree to a remote viewing session. Remote viewing is a psychic method of acquiring intuitive information about people, places and things. It was researched for more than a quarter of a century, first by the CIA, and later by the U.S. Army, which created a unit of operational remote viewers to spy on the old Soviet Union and others. Swann, who coined the name .remote viewing. as an alternative to the term .clairvoyance,. studied the phenomenon at Stanford Research Institute and helped train many of the Army.s viewers. During his remote viewing for Mr. Axelrod, Swann realized he was viewing scenes on our moon, but not anything remotely like the moon that we have learned about. He saw water and a weak atmosphere on the moon, essentials for life. He also saw structures, machinery, bridges, tracks, and other evidence of an active presence on this supposedly dead world. His incredible adventure with Mr. Axelrod and the moon is detailed in Swann.s 1998 book Penetration: The Question of Extraterrestrial and Human Telepathy. But, as in so many bizarre remote viewing sessions, Swann received no immediate .feedback. following his strange mental vision of the moon. Swann himself has stated that without adequate feedback, no remote viewing can be said to have taken place. It was about a year later when Swann felt as though he finally got feedback on his strange mental journey to the moon. It came in the form of a book published in 1976 titled Somebody Else Is On The Moon, by George H. Leonard. The book arrived in the mail with no return name or address. In this book, almost impossible to find today, Leonard reproduced many NASA moon photographs as well as tapes from Apollo missions and concluded that .a highly advanced underground civilization&is working the surface of the moon - mining, manufacturing, communicating, and building!. .Leonard.s book was filled with verifiable data, official photos, and sketches of structures, etc., he created from the photos,. stated Swann. .Many of Leonard.s sketches resembled some of mine.. Yes indeed, the mysterious Mr. Axelrod had provided me feedback as promised, for there could be no doubt that it was his jolly self that sent Leonard.s book to me..
Swann.s adventure with the moon occurred in 1975-76. Since then, several other authors claimed to have found the same evidence as Swann and Leonard, regarding aliens on the moon. In 1982, author William L. Brian II in his book, Moongate: Suppressed Findings of the U.S. Space Program, detailed information about activity on the moon and posited .In all probability, the United States manned exploration of space never stopped after the Apollo missions. It is an interesting possibility to consider that Russia might be sending cosmonauts on extended trips to the moon or other planets for up to six months using the Salyut 6 space station as a cover. Of so, what might the United States be doing, and could the Space Shuttle Project be another decoy for military space operations?. 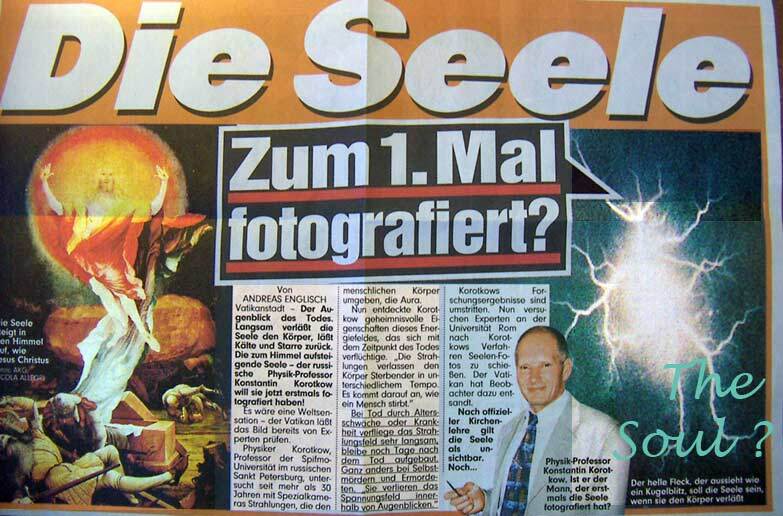 By 1990, author Fred Steckling had printed five editions of his book, We Discovered Alien Bases on the Moon, a collection and analysis of 125 official NASA photographs. Steckling too concluded there was water, atmosphere, even vegetation on the moon and, after a careful examination of the photos, concluded, .There seems to exist a tremendous technology on the moon&. Since the books mentioned above are hard to locate, current researchers might study the second revised edition of the 1995 book by David Hatcher Childress.s, Extraterrestrial Archeology, available through Adventures Unlimited Press. This book is rife with NASA photos, drawings, and maps detailing what the author says are pyramids, domes, robot mining vehicles, tunnels, bridges, and other structures on the moon. Most compelling is a NASA blowup (NASA, VII Gassendi S 2.4) which shows two rounded objects leaving tracks across the lunar landscape. The larger object leaves behind irregular track marks, while the smaller object appears to have rolled up the side of a moon crater, then moved down the crater and out onto flat ground, leaving behind a slightly curved track. Also fascinating are other photos. NASA No. 16-18918, which clearly shows a large oval object jutting out over the lip of a large moon crater, and No. 16-19265, which seems to show a large circular/domed object nestled next to 10 regularly-spaced objects, in what appears to be a partially underground hangar. - A .star. was seen within the body of a crescent moon .directly between the points of her horns. on March 5, 1587. - During March and April of 1787, Britain.s Sir Frederick William Herschel, pioneer of the reflecting telescope and discoverer of Uranus, claimed to have sighted three .bright spots,. four volcanoes,. and lights moving .above the moon..
- In July 1821, a German astronomer reported sighting .brilliant flashing light spots.. His was one of numerous reports of flashing or blinking lights seen on the moon. - In February 1877, a line or streak of light was seen stretching across the crater Eudoxus. This light was observed for about an hour, ruling out the possibility that it was merely a meteorite striking the lunar surface with a flash. - Two steaks of medium intensity light were recorded on June 14, 1940, in the crater Plato, a location where reports of lights have numbered in the thousands. - A .black cloud surrounded by violet color. was seen in the Sea of Tranquility by Canadian astronomers on September 11, 1967. - New York Herald Tribune science editor John J. O.Neill on July 29, 1953,claimed to have seen a 12-mile-long .bridge. straddling Mare Crisium. After reporting his find to the Association of Lunar and Planetary Observers, O.Neill was scorned by astronomers. However, a month later, the .bridge. was confirmed by British astronomer Dr. H.P. Wilkens, who told the BBC, "It looks artificial. It.s almost incredible that such a thing could have been formed in the first instance, or if it was formed, could have lasted during the ages in which the moon has been in existence." Further confirmation came from Patrick Moore of the British Astronomical Association, who declared the .bridge. had .popped up. almost overnight. Such Lunar Transient Phenomena (LTP) are well known among veteran astronomers. Bright and blinking lights, colorful displays, clouds, or mists have been reported in many lunar craters, especially those of Aristarchus, Plato, Eratosthenes, Biela, Rabbi Levi, and Posidonius. Then there are the numerous NASA photos of UFOs both on and near the moon. A 1972 16mm film taken from Apollo 16 (NASA File Roll 9361) clearly depicts a spherical craft with a domed top, flying far over the moon.s cratered surface. Just as amazing are photos of gigantic cigar-shaped objects traversing the moon.s face in NASA No. 16-19238 and 11-37-5438. A Lunar Orbiter IV photo (No. LO IV 89-H-3) depicts a large, cigar-shaped object reflecting light while sitting on the surface near the crater Romer. One thing seems clear - the moon is far from being a dead world. Something is happening on our moon, something so profound that, despite our capability for further exploration, we are prevented from returning. 2. The complete failing of the western economic system and governments. 3. Cities will become unsustainable and awash in chaos. 4. Religious fundamentalism will rage against any personal freedoms. 6. 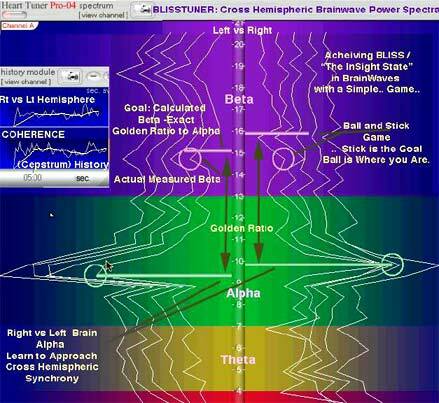 Free energy (5th dimensional energy) will be demonstrated as a fact. 7. Levitation (anti-gravity) will become understood. 8. 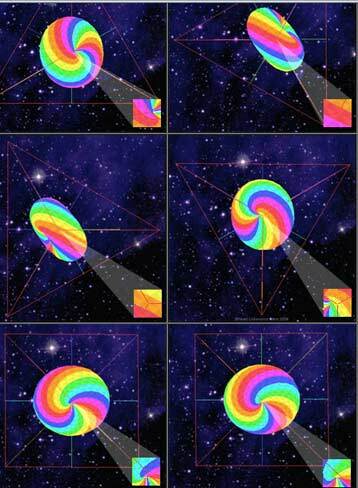 Movies and TV will become holographic projections. 9. Teleportation of objects will begin. 10. Telepathy will become an acknowledged means of communication in some persons. known and studied for application world wide. people that survive the turmoil. clear the decks for the continued evolution. So what to do with these circumstances approaching? Very simple, follow what the Hopi people have been giving as advice. their water over long distances. produce and meat in stock. to make that move and here are a few suggestions. lines are no fun when you gotta run. some simple spices, dried soups, fruit ECT. batteries) and a first aid kit. city and toward some rural area where your face and smile are known. We as spiritual beings or souls come to earth in order to experience the human condition. This includes the good and the bad scenarios of this world. Our world is a duality planet and no amount of love or grace will eliminate evil or nastiness. We will return again and again until we have pierced the illusions of this density. The purpose of human life is to awaken to universal truth. This also means that we must awaken to the lies and deceit mankind is subjected to. To pierce the third density illusion is a must in order to remove ourselves from the wheel of human existences. Love is important but knowledge is the key! (the nexus of things for Nexus Magazine). IG: Dan - What is your view of the current world situation. 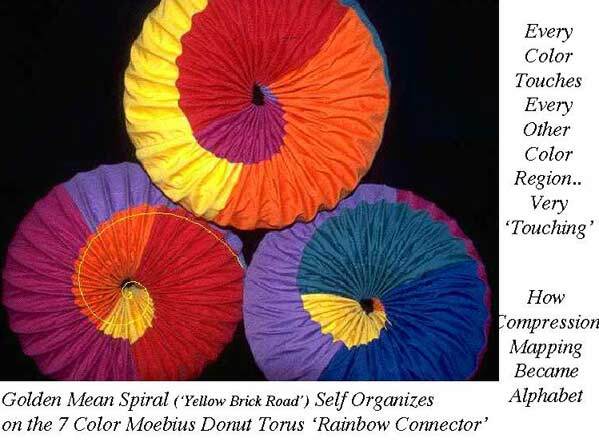 which could more readily learn self-similarity -- self-organizing -- self awareness . and gravity making power of those genes. own DNA are stupid Ostriches with their head buried in sand, soon to die. interventionists versus... at lettersfromandromeda.com ). DNA is their food - which they themselves lost the ability to make internally). 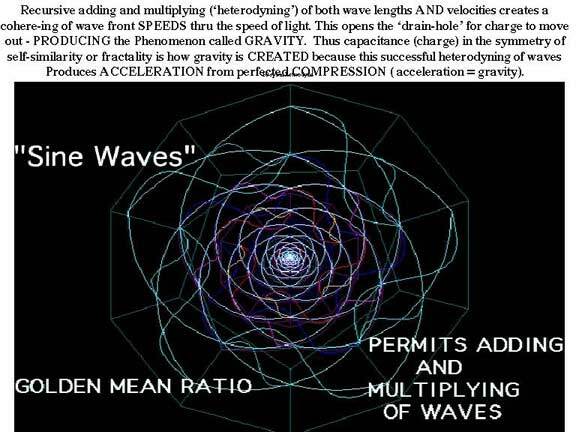 is the result of 'self wareness' teaching waves to agree / fuse by imploding). you cannot imagine what it is like to live in the Sun, that is your problem. for the children of Earth. The physics of why parasites die in Sunlight is most instructive. politics is probably true but it might be scary so I don't want to know"
in order to get the flavor of current Earth wars. fund Gothic cathedrals is such an interesting paradox of the real truth. of gives the phrase: 'wealth from the SPICE trade' new meaning doesn't it?'. ordering / fusion / union / implosion, are SELF canceling). (sharable) is CALLED: A BURNING 'BUSH' EXPERIENCE. (I do enjoy the irony). alive and shareable in your body. classrooms), America put their steering in the path of needing to taste death. Catholic church in being the instigator of the most planetary wars. candidate mind control experiments next door to WACO they had to shoot them. -then the survivors got so pissed they bombed Oklahoma city. war on the soviets, then dump the experiment victims). numerological rambling about the disaster pointing to the Templar's etc. laundry which MADE these enemies. of terrorism (genocide) could give the death's in NY some meaning. (charge fractality) you then eliminate the biological requirement of dying. the privelege of only those who do not require secrets.